I've heard of "soft lighting" and "hard lighting". What do these mean? How can I control how soft a light is? Hard and soft lighting is actually a slight misnomer, as 'hard' and 'soft' actually refer more to the shadows cast by the lighting. Hard lighting creates a shadow with a sharply defined 'hard' edge. Soft lighting gives a more gradual, soft edge to the shadow. A light can be so soft that it in fact casts very little discernible shadow at all. To soften lighting, you need to diffuse it; in other words, you need to scatter it. Consider the sun. When there are no clouds and the Sun is bright, you can see well defined shadows everywhere: from the trees, from people, and even on people's faces where their features cast shadows. You can easily discern where the light source is from the direction of the shadows. When the weather is cloudy, however, the clouds scatter the light across the sky, resulting in much softer light, and fewer, softer shadows: cloudy conditions are ideal for portraits, for this very reason. In terms of artificial lighting, a hard light would be a clear glass bulb, or an on-camera flash. Softening artificial light depends on your equipment. If you have a speedlight with a swivel head, you can point it up at the ceiling or at a wall, so the light bounces off the surface and is scattered, or you can buy (or make) clip on diffusers. If you have true off-camera lighting, you can use a photographic umbrella or softbox to soften the light. The hardness or softness of a lightsource is determined entirely by the number of angles light is coming from (not the number of angles it's going to, that is the spread of the beam). A lightsource producing light from many angles will have the effect of filling in shadows, and provide a gradual falloff (transition from lit to shadow). This is because as a surface curves away from the light the number of illumination angles slowly reduces. Contrast this with a hard source which produces light from only one angle. As a surface curves away from the light there becomes a point where the single lighting angle is at 90 degrees to the surface so the surface is no longer lit, giving a hard cutoff. 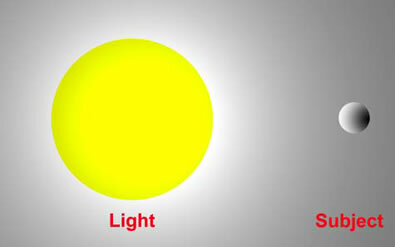 The biggest factor in the hardness or softness of a lightsource is the relative size of the light emitting surface. Large sources are in general soft* as they have a large illuminating surface, and thus each point will emit light from a different angle. You can make a lightsource bigger by putting a diffuse translucent object infront (this is called diffusing the light), the light shines out of a hard source from and single angle, and is then re-emmited from the diffusing material at many angles. Here a relatively small lightsource results in a hard boundary between the lit and shaded side of the object. Here a relatively large lightsource results in a softer transition from light to shade as the light can still reach the far side from certain angles. I say relative size, as it's all to do with the angles. If you move a large source further away, the range of lighting angles decreases. The ultimate example of this is the sun. The sun has a huge light emitting surface, but is very far away, so there's little difference in angle of incidence between light coming from the top and bottom of the sun. The sun is thus a hard source, as demonstrated by the hard transition from light to shade you get on a sunny day. *large sources can be hard, if they have something to limit the number of angles light is emmitted from, such as a grid or snoot. The hard light produces deep shadows, often not desirable. You can search photos taken during midday. You are likely to see the deep shadows appearing then. Harsh light is bad especially for portraits and landscapes. The light is harsh, resulting in low contrast scenes. If the hard light comes from the front, your portrait will have harsh look, many details, that may be undesirable, and of course, low contrast. If the hard light comes from either side (left or right), this side will be harsh and the other side will have deep shadows. In both situations however, the light QUALITY is not good. This is a general rule. There are photos of portraits, for example, that were taken during midday on purpose (maybe the hard harsh light served well to the overall idea of the photos). It depends on what you are intending to show through your photos. In general though, hard lighting is not much appreciated by fashion, portrait and landscape photographers, for the reasons already mentioned. 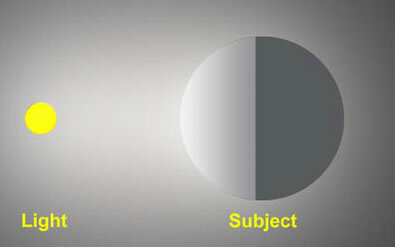 As a rule of thumb, the quality of the light (either hard or soft) depends on the size and the direction of the light. What do I mean? The sun, for example, is far away, therefore small, and directional, when the sky is clear. Then we have harsh light. On the other hand, when the sky is cloudy, the sky becomes a larger source of light and more in-directional, spreading all over the sky. For this reason we have soft light! If you are shooting during midday a friend or someone else, you can do two things: either shooting in shadow with adequate light, or shooting in sun light, using a reflector or an external flash to compensate for the shadows. These are general scenarios. It mostly depends how much hard or soft light covers the face of the model, for example. Many photographers, especially landscape and fashion photographers, shooting outdoors, prefer the golden hours. Golden hour is considered an hour after the sun rises and an hour before the sun sets. Then the light is very soft and the color temperature is much more better - almost 3500K (kelvin), whereas during midday is around 5500K. Hope that helps. I know that there are several things you can find in books and on the Internet, but these can be good enough guidelines to make a nice introduction. I find these explanations confusing as in the studio with softboxes my shadows are deeper/harsher when the light is close by, softer lighter shadows when the light is further away - the complete opposite of what I am told! Are we simply talking about the ‘edge’ of the shadow or it’s density? I’ve found the closer the light, the denser the shadow.